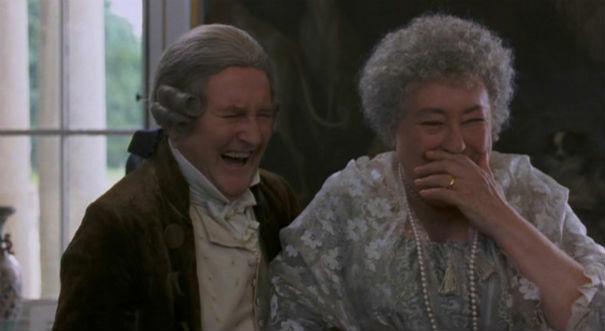 When I first saw Ang Lee’s adaptation of Jane Austen’s Sense and Sensibility, I had just finished reading the book and to be quite honest, I didn’t care for it all that much. 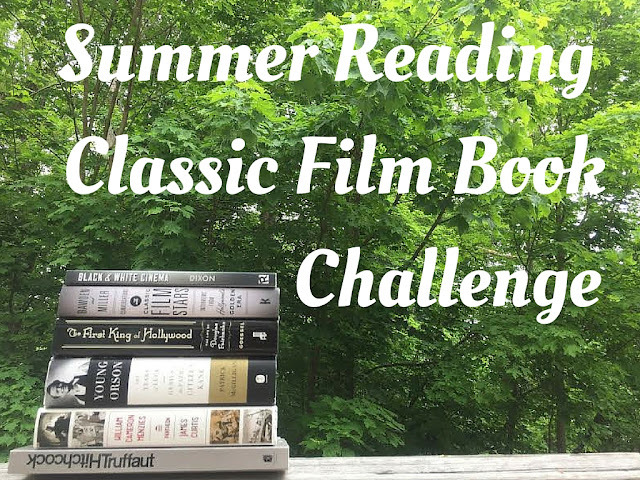 Emma Thompson won an Oscar for her adapted screenplay and, when I first saw it, I was really unhappy with the changes she’d made to the story and some of the characters. 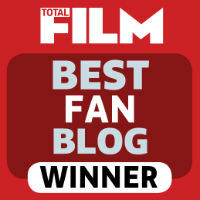 But after repeat viewings, I fell deeply in love with the film, despite said changes. I think it’s really one of those times where you have to suit the story for a new medium and modern audiences (kind of like the 2006 version of The Painted Veil). 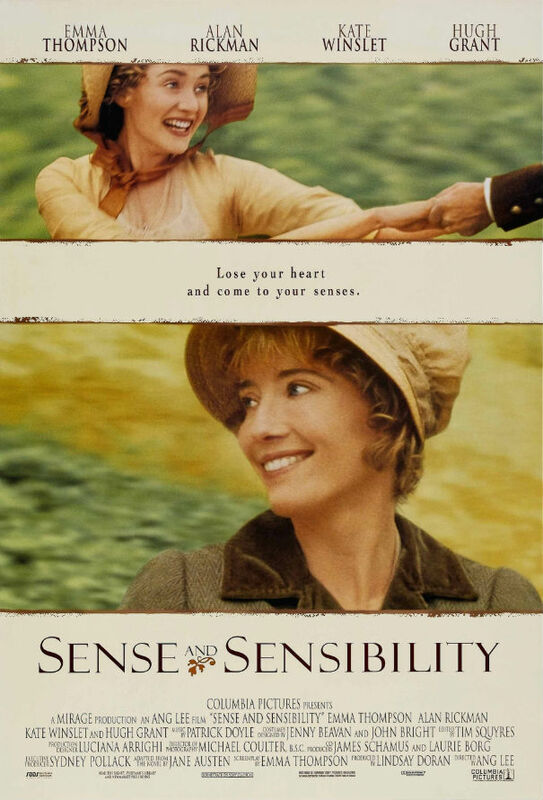 Sense and Sensibility was nominated for seven Academy Awards, winning one: Best Dramatic Score, Best Costume Design, Best Cinematography, Best Adapted Screenplay Emma Thompson (won), Best Supporting Actress Kate Winslet, Best Actress Emma Thompson and Best Picture. 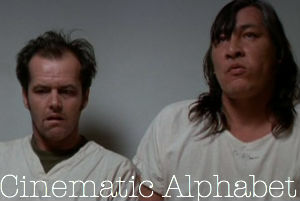 The other films nominated for Best Picture that year were Apollo 13, Babe, Il Postino and winner Braveheart. Both Ron Howard (Apollo 13) and Ang Lee were not nominated for Best Director, despite their films being nominated for Best Picture. Those two spots were given to Tim Robbins (Dead Man Walking) and Mike Figgis (Leaving Las Vegas). Lee, however, was nominated for Best Director by several critic associations, as well as at the BAFTAs, the Golden Globes and the DGA. 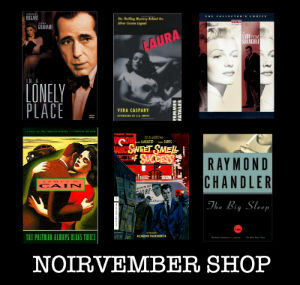 He was also named Best Director by the National Board of Review. 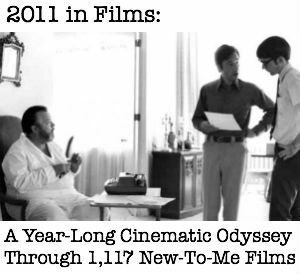 This film has a long and complicated production history (including multiple Wikipedia pages on the subject! ), that I don’t really care to relate in this piece. Definitely check out the film’s pages on Wikipedia if you are interested. This was Ang Lee’s first film completely in English (Lee himself has an interesting history, which I urge you to read about) and since has been nominated for five Academy Awards, winning twice (plus accepting the award for Best Foreign Language film for Taiwan for his film Crouching Tiger, Hidden Dragon). His nominations were for Best Picture/Best Director for Crouching Tiger, Hidden Dragon, Best Director for Brokeback Mountain (won), Best Picture and Best Director (won) for Life of Pi. I also feel I need to point out that this film was produced by Lindsey Doran, who spent tens years developing the project. Her other films include Dead Again, The Firm and Stranger Than Fiction. Elinor Dashwood: You talk of feeling idle and useless. Imagine how that is compounded when one has no hope and no choice of any occupation whatsoever. 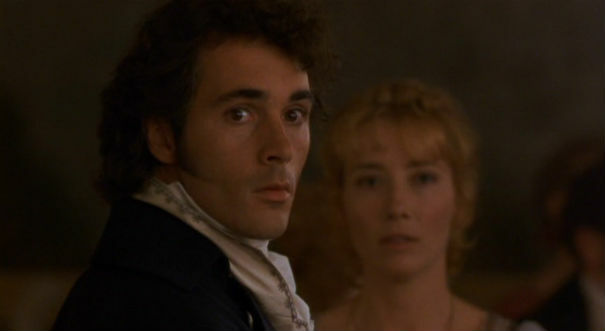 Edward Ferrars: Our circumstances are therefore precisely the same. 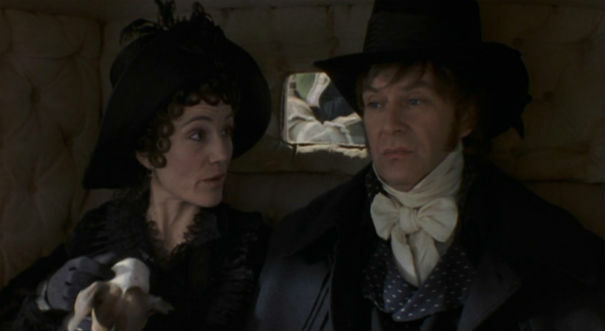 Elinor Dashwood: Except that you will inherit your fortune. We cannot even earn ours. Little things like this allow Thompson the writer to inject latter-day feminism into Austen’s already quite feminist novel. I love Emma Thompson dearly, but she is definitely too old to be playing Elinor. That said, she is wonderful in this role and it is clear that she knows the character inside and out. Along with her Best Adapted Screenplay win, she also received a Best Actress nomination. 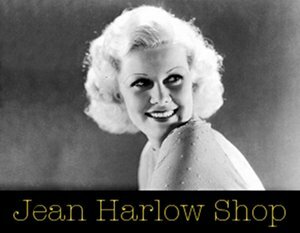 She’d been nominated for three Oscars prior to her work in this film: Best Actress for Howard’s End (1993, won), Best Actress for The Remains of the Day (1993) and Best Supporting Actress for In The Name of the Father (also 1993). 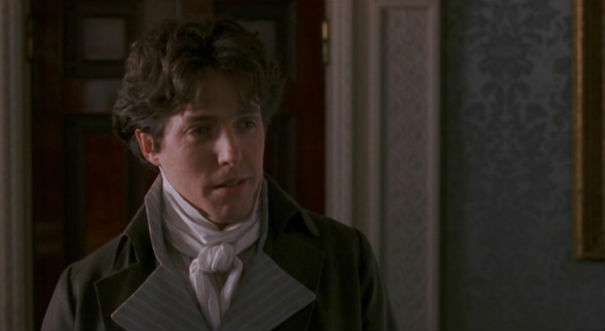 I like the relationship between Edward and Elinor as portrayed by Thompson and Hugh Grant, as I think the two have really wonderful chemistry together. They are two awkward, quiet people and they find solace in each other’s company. Grant’s stuttering, gawky persona melds perfectly with the character as written and his posh accent is perfect for this kind of British “heritage” film. As the film’s plot goes, Edward’s sister Fanny wants more for her brother in terms of marriage than the, relatively poor Elinor and sends him away before their “attachment” grows into a full on “understanding.” This leads to Elinor’s mother to take some distant relatives up on their offer to allow them to rent a cottage on their property at a reasonable rate. 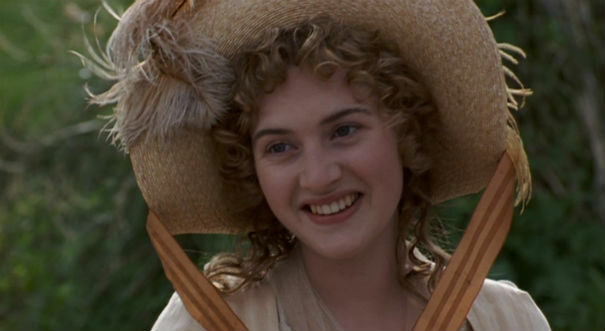 I haven’t yet mentioned Kate Winslet as Marianne, mostly because the bulk of her story happens after the family moves to Devon. I do, however, love our introduction to Marianne. She’s playing a depressing song on the piano after we discover the death of her father. Elinor asks her to play something a little less depressing, so she plays an even more depressing dirge. It’s a wonderful way to establish her character without having said a word. 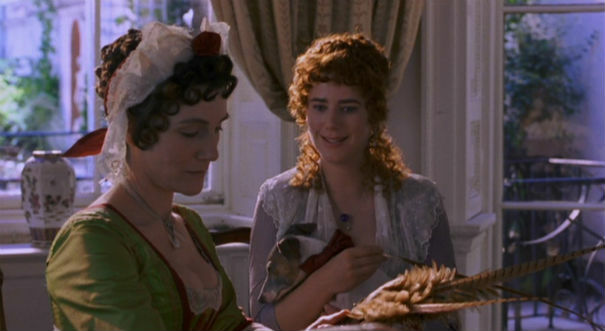 While in Austen’s original novel, it’s clear that Elinor represents “sense” and Marianne represents “sensibility,” the two share aspects of both temperaments in the film. The relative in Devon, Sir John Middleton, is played with gusto by Robert Hardy. His mother-in-law, Mrs. Jennings is currently visiting. She is one of those well-off widows who has money to burn and spends her days visiting everywhere and anywhere she pleases. 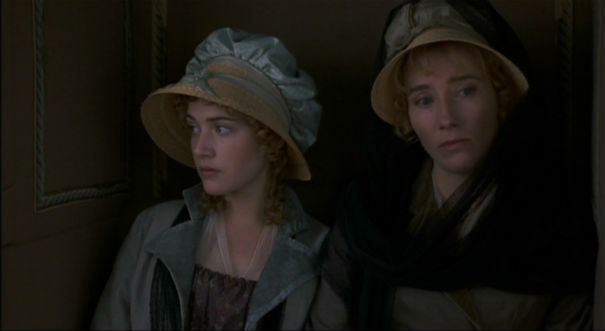 She’s just married off her daughter (more on this later) and thus decides she must help Mrs. Dashwood marry of hers as well. 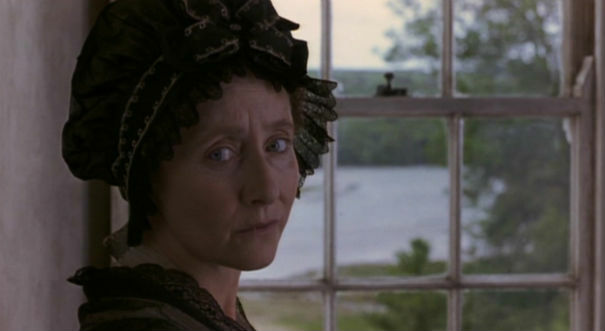 Gemma Jones does an excellent job with the role of the recently widowed Mrs. Dashwood. She’s got the air of grief, but she’s not so overwhelmed with it that she neglects her daughters. Jones you will probably remember as the mother of Ms. Bridget Jones in Bridget Jones’s Diary. 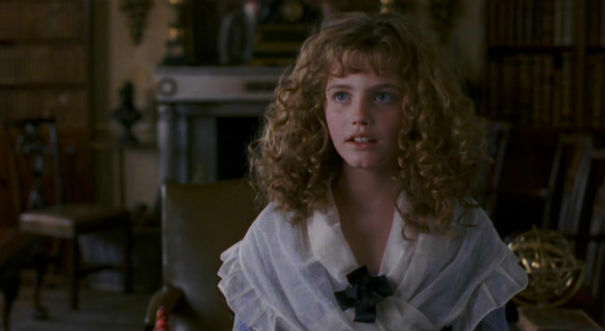 Thompson definitely took liberties with the youngest Dashwood Margaret, giving her an interest in Geography, as well as expanding her relationships with her sisters’ suitors (like the fencing scene between her and Edward earlier in the film). This was actress Emilie François first film and according to IMDb, only one of three in which she appears. She graduated from Cambridge in 2003 and converted to Islam. She’s delightful in this film and it’s a shame we haven’t seen more of her. Early on after their move to Devon, the Dashwoods are invited to dine with Sir John and Mrs. Jennings. 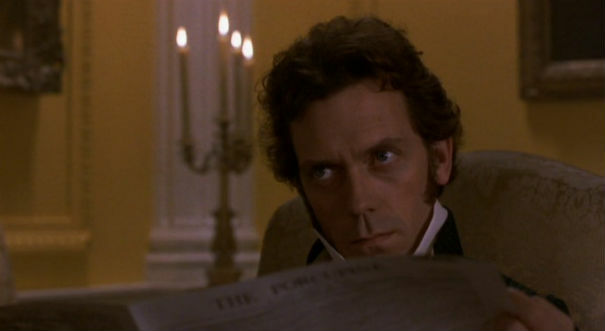 While there, Marianne plays the piano and just as she’s about to finish the oft-discussed, but as of yet unseen Colonel Brandon appears. I must say the casting of Alan Rickman in this role made me like him loads more than the description we received in the novel. Rickman is so gruff and yet so charming and his acting so subtle, it really elevates the part. I will neverrrrr get over the part where Margaret asks him if he’d actually been to the East Indies, then asks him what it’s like. He replies, rather playfully, “the air is full of spices.” Every time I see Rickman, I hear him saying that in my head. Marianne, of course, doesn’t care for Brandon despite Mrs. Jennings’s best efforts to match the two up. She needs romance more like what she’s read in books. 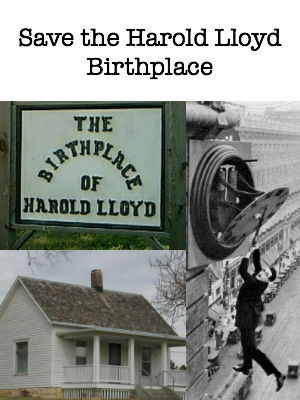 One day while out walking with Margaret, she sprains her ankle and, just like in a novel, a handsome stranger stumbles upon them and saves her, carrying her home. This as it turns out is John Willoughby, who is visiting a rich aunt nearby. Marianne, of course, falls for him instantly. Brandon, being the true gentleman he is, steps aside, despite what we can see are deep feelings. Winslet shines during this part of the film, filling the screen with amazing effervescence and joy. Wise and Winslet compliment each other perfectly matching passion for passion. It’s the quintessence of a storybook romance, brought to life. Winslet received her first of six Oscar nominations for her performance in this film (she was 18 while filming and later became the youngest person to receive six Oscar nominations). Her nominations are as follows: Best Supporting Actress Sense and Sensibility (1995), Iris (2001), Best Actress Titanic (1997), Eternal Sunshine of the Spotless Mind (2004), Little Children (2006) and The Reader (2008, won). As always, things don’t end well between Willoughby and Marianne, mostly due to him being a cad (we all know what that means) and his need to make a quick – and rich – match before being disinherited. Wise apparently dated Winslet on the set for a while before she set him up with Thompson after her divorce from Kenneth Branagh was finalized. Wise and Thompson have been married since 2003. Elinor: Marianne, oh, Marianne – it is better to know at once what his intentions are. Dearest, think of what you would have felt if your engagement had carried on for months and months before he chose to put an end to it. Marianne: We are not engaged. with some kind of understanding? Marianne: No – he is not so unworthy as you think him. Elinor: Not so unworthy! Did he tell you that he loved you? Marianne: Yes. No – never absolutely. It was every day implied, but never declared. Sometimes I thought it had been, but it never was. He has broken no vow. Marianne: He did! He did – he loved me as I loved him. There is sooooo much going on in that one exchange. Commentary on relationships, appearances, love, marriage, etc. etc. Marianne: Always resignation and acceptance. Always prudence and honour and duty. Elinor, where is your heart? 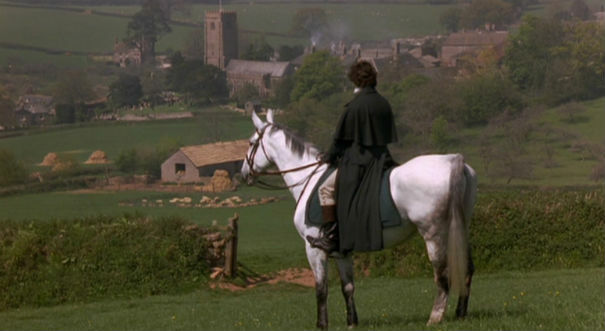 Elinor Dashwood: What do you know of my heart? What do you know of anything but your own suffering. For weeks, Marianne, I’ve had this pressing on me without being at liberty to speak of it to a single creature. It was forced on me by the very person whose prior claims ruined all my hope. I have endured her exultations again and again whilst knowing myself to be divided from Edward forever. Believe me, Marianne, had I not been bound to silence I could have provided proof enough of a broken heart, even for you. Scenes like this are why this film is a masterclass of acting, which I think is what happens when you have a script written by an actor. 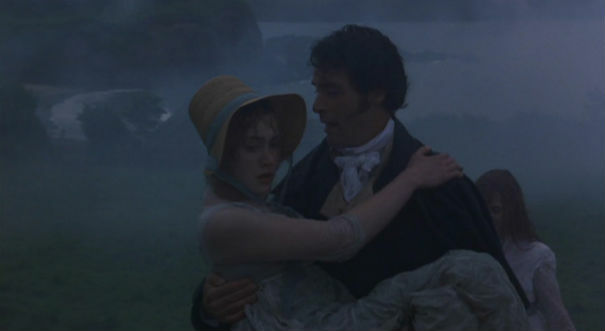 Marianne, staying true to her overly romantic nature, goes out in a deluge to stare at Willoughby’s estate and lament her forever lost love (he’s married to a rich heiress at this point). This gives us a nice mirror moment, where Brandon saves Marianne in the rain, much like Willoughby had done earlier in the film. Marianne pulls through her pneumonia and later we see that she begins to see the love Brandon has for her is just as real as the passionate love Willoughby had for her, only his is perhaps stronger. While the double wedding scene is beautiful and everything we want for our characters, one of my main problems with both the film and the story itself, is its insistence that marriage really is everything a woman can hope for in life. I understand when the book was written and thus when it is set, that would be the only future for these women, but I wish the film had a bit more to say about it being the only future for them. But I guess all films can’t be as forward thinking as Gillian Armstrong’s Little Women. And at least the two women end up with men who are truly their equals. The very last shot of Willoughby is not quite how we leave the character in the novel, but I think it adds to the melancholic undertones of the film and serves as a greater comeuppance for the character, as he now gets to observe the love of his life in a happy state that he could have had if 1) he hadn’t been such a cad and 2) had chosen love over money. I have to end this post with Emma Thompson accepting her award for Best Screenplay at the Golden Globes wherein she pretends she is Jane Austen. It is the most fabulous of things. Posted on March 11, 2013, in Oscar Vault Monday and tagged Alan Rickman, Ang Lee, Elizabeth Spriggs, Emilie François, Emma Thompson, Gemma Jones, Greg Wise, Harriet Walter, Hugh Grant, Imelda Staunton, Imogen Stubbs, James Fleet, Kate Winslet, Robert Hardy, Sense and Sensibility, Tom Wilkinson. Bookmark the permalink. 4 Comments. I haven’t seen this film in so long. I definitely need to give it another viewing. But what a great cast! And a fantastic director as well. 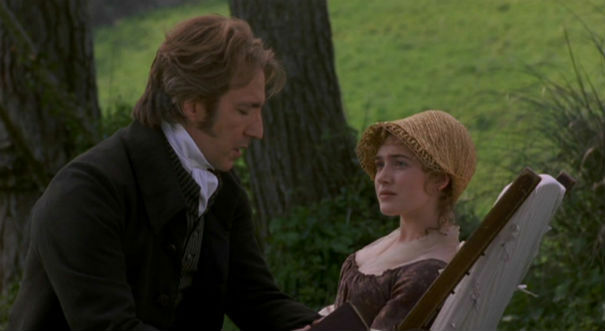 Sense & Sensibility is one of my most favourite movies of all time! 😀 I’ve watched it repeatedly and love it still.